Doing a yoga ball workout during pregnancy is the best way to stay fit and prepare for labor. When I was pregnant, I enjoyed doing my yoga ball workout every morning. I recommend that you do it, too. The yoga ball provides you with a lot of support during your prenatal yoga training, especially as you get closer and closer to your due date. After the fourth month of pregnancy, your should give up doing abdominal work on the floor because it can put pressure on your vena cava and make you feel lightheaded and prevent blood flow to your baby. The vena cava is a large vein which carries blood back to the heart. The weight of the uterus on this particular vein can cause a drop in blood pressure and reduced blood flow to the brain making you dizzy. Also, it may reduce the amount of blood that goes to the baby through the placenta. With the yoga ball, you can work the abdominals longer into your pregnancy because you are not lying on your back, but balancing on the ball. This is very helpful because it helps prepare strong abdominal muscles you will be using during labor and at the same time, it is very safe for your baby. Your labor and recovery time will be shortened as a result. To learn more, get the Birthingball Handbook. The yoga ball is a piece of fitness equipment that helps you learn coordination, proper posture and balance. It is also called the stability ball, the fitness ball, the Swiss ball and the birthing ball. They all mean the same thing. The yoga ball is an exercise ball constructed of elastic soft PVC with a diameter of approximately 35 to 85 cm (14 to 34 inches) and filled with air. When seated on a fully but not over-inflated ball with your knees over your ankles your hips and knees should be flexed approximately 90 degrees, positioning your thighs approximately parallel to the floor. Your hips should be level with or slightly higher than your knees. Make sure to use the yoga ball size that fits you. 1. A yoga ball workout is especially useful to keep you in shape during pregnancy. 2. Using a yoga ball can help you maintain balance and stability during pregnancy, especially as your belly grows. 3. A yoga ball workout helps keep the abdominal muscles strong because strong abdominals are important during the pushing phase of labor. 4. Yoga ball squats when performed before labor help position the baby correctly for birth (head down with the back of the baby's head towards the front of your tummy). 5. Yoga ball squats performed during labor help the baby descend faster into the birthing canal. 6. The yoga ball conforms to your body so it helps with relaxation. 7. The yoga ball is used during pregnancy to help relief lower back pain. Before beginning any form of activity during pregnancy, ask your doctor if this type of exercise is good for you. Make sure you do not overstretch. 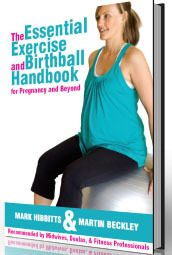 I recommend the Yoga Ball Workout E-Book to all Moms-to-be because it easy to read and very informative. You will find lots of tips that you can use not only during pregnancy, but also to get back into shape after your baby is born. The use of the birthing ball in late pregnancy provide essential support during functional exercises such as squats, keeping you strong and well prepared for delivery. You will have a shorter labor and you will be able to return to your pre-pregnancy weight faster.